Product Description: Extremely popular manual seal tool available in 1/2" (up to .023), 5/8" (up to .023), or 3/4" (Up to .025). Product Description: Heavy-duty steel strap windlass tensioner used for heavy duty applications (e.g., carloading. Runs 1 1/4" up to .050 with minimal effort. 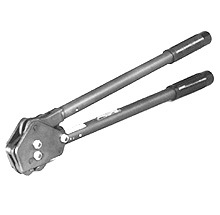 Product Description: Heavy-duty tensioner used for heavy duty applications (e.g., carloading). Runs 2" up to .050. 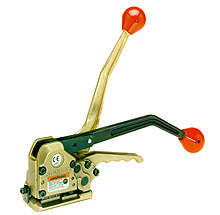 Product Description: Side-action/single crimp heavy duty sealer designed for use with signode heavy duty series seals. To be used with a variety of 1 1/4" gauges and 2" x .044-.050. Product Description: Front-action/double notch regular duty sealers designed for use with Signode "C" series seals. Available in 3/8", 1/2", 5/8" and 3/4". Product Description: Lightweight (7lbs.) 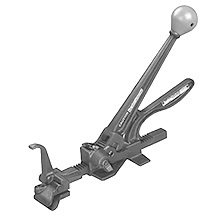 portable batter powered tool for steel strapping with a variety of strap types. Product Description: Push-type feedwheel tensioner for round or irregular bundles. Tool has unlimited strap take up and rungs 3/8"-3/4" up to .023 with minimal effort and interruptions. Product Description: Push-type feedwheel tensioner used for round or irregular bundles. 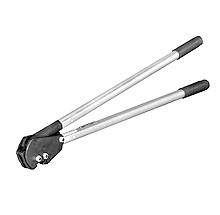 This tool has unlimited strap take up and runs 3/4"-1 and 1/14" up to .035. Product Description: Used for heavy, round and/or irregular-shaped loads. Runs 3/4" - 1 1/4" up to .035 with minimal effort and decreased interruption. Product Description: This RCD verision is designed for Signode "OF" and "P" series seals and is used with 1 1/4" x .029-.031. 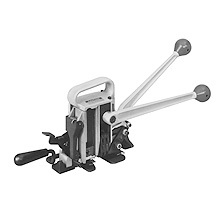 Product Description: Sealless combination tool that tensions, makes a three-key sealless joint and cuts without seals. Runs 1/2" x .017 up to 3/4" x 25. Product Description: Heavy duty sealless combination tool that tensions, makes a three-key sealless joint and cuts without use of seals. Runs 5/8" x .023 up to 3/4" x .031. Product Description: Front-action/single reverse notch regular duty sealers designed for use with Signode "SPC" series seals. Available in 3/8", 1/2", 5/8"
Product Description: Side-action/single notch heavy duty sealer designed for use with Signode "34 HC-OF", "34HOC" and "34SHOC" series seals. Available in 3/4" only. Product Description: Medium tension feedwheel tensioner for general use. Runs 5/8"-3/4" up to .025. Desired tension with minimal effort and minimal strap waste. 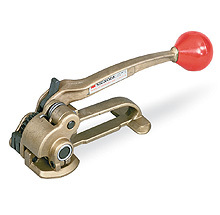 Product Description: High tension feedwheel tensioner for medium duty steel strapping. Runs 1 1/4" up to .035. Product Description: Side-action/double notch regular duty sealers designed for use with Signode "C" series seals. Available in 1/2", 5/8" and 3/4".